If you’ve ever imagined that there could be real “cloud-shaped white fluffy sheep on a hilltop” (like you see in kids’ drawings), I reckon it would be her. Horrietta, a Suffolk/Merino cross, lived on the Big Ben Station in the foothills of the Southern Alps. Stations in New Zealand are very large farms, where the animals are free to roam large distances for long periods of the year, only being mustered for essential work such as shearing. Every year, the sheep would be mustered for their annual shear, and every year for seven years, Horrietta decided she didn’t want to go. She simply turned and went the other way, and hid where the musterers and dogs couldn’t find her. Sheep are traditionally herd animals. The hermits (as lone sheep who evade mustering are called) are usually males. Horrietta was unusual in being a female hermit (although they didn’t know that at first and initially called her “Horace” until the mistake was discovered). Eventually though, her wool got so heavy (13kgs/28lbs) that she began to have foot problems. So a concerted effort was made to capture her, and bring her in to be shorn by hand using blade shears. This is Horrietta after she’d been shorn, and her lambs Henry and Camilla, from a handsome merino ram named “Johnny Depp”. They were born on the first day of Spring in 2012. The difference is quite remarkable. Her staple at shearing was 12″ long!! Now she lives with two of the casual musterers who work on the station she lived on. They thought that her wool could be appreciated by hand spinners around the world, and Bev has happily taken on the task of making sure that can happen. The original fleece has now all been sold, and the proceeds donated to the mountain search & rescue dogs charity – NZ Land SAR Search Dogs. Her owners hope that Horrietta and her lambs can continue to contribute to this worthwhile cause through the ongoing sale of their fleeces. Horrietta’s latest fleece has been graded an even finer micron that her first (it’s somewhere around 22 – 24 microns, but I cannot remember exactly). It is very fine quality. The fleece is extremely white, with no ‘black material’ and has loads of crimp and spring. There are some beautiful examples of the fleece spun into yarn in the Ravelry group noted below. Horace Hermit (Facebook) where you’ll see some cool pictures of where she lived and you’ll get an idea of how it was that she managed to evade capture for so long. NZ Hermit Sheep (Ravelry) where future fleeces will be made available for purchase. Or, you can drop Bev a line on morecraft@xtra.co.nz to arrange to be notified when the next shearing takes place in November. Hope you found that interesting! Many thanks to Bev Tilson for supplying the information for this post. Categories: Merino, Wool | Tags: Horrietta, Interview, New Zealand, sheep, Wool | Permalink. Welcome to my blog where I talk about knitting in New Zealand and the beautiful yarns you can find here. Thank you for sharing this story with us. Having family that used to own one of those large inland South Island stations where we spent many very happy holidays especially summer holidays and the fun and freedom we experienced and in particular the time of year when my Father would join the annual muster as his annual holiday, I know that there would be escapes, sheep and horses in some years. The fleece sounds simply wonderful. 🙂 Have you ever managed to buy any yourself??? I still have of the fibre from 2nd shear still avalible if you are interested,this is only about 2-3 inches in length.It spins up very well .Or you may like to put your name down for some of the next shear. Great story, and thanks for all the links too. I couldn’t like this post enough! 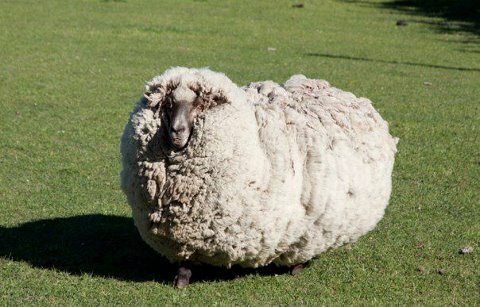 I love Horrietta’s story, what an amazing sheep! We were in New Zealand in 2011 and saw three of these hermits (although we didn’t know what they were called). How interesting to hear the rest of the story. Your country is simply stunning and the people friendly. We had a great 2 weeks and hope to come back some day. Seeing that first picture, it’s amazing that Horrietta could even move her legs. What a character and interesting life this sheep has.